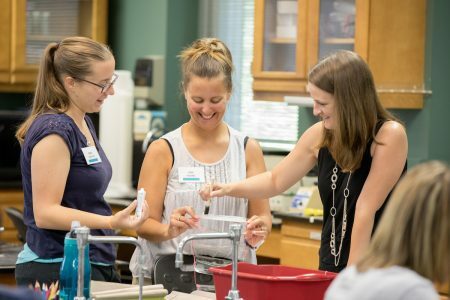 Teachers apply lotion to a plastic tube for an experiment on biofilm bacteria. Earlier this week, the smell of hot sauce permeated the biology lab in Martin Science Building. Inside, Lynchburg area elementary school teachers worked in groups, lathering Texas Pete sauce as well as hand sanitizer, Vaseline, and other solutions onto pieces of plastic, and tying them together with string. “Which one of these will keep biofilm bacteria from growing?” asked Amanda Rumore, a Randolph biology professor leading the session. To answer that question, the teachers took their newly created “biofilm prevention test kits” outside to the Dorothy Crandall Bliss Botanical Garden, where Rumore dipped each one into a fish tank filled with water from the nearby pond. Though the teachers wouldn’t see the results for a few days, Rumore revealed that hot sauce, combined with a small amount of Vaseline or other lotion, was the most effective deterrent. This activity was part of Randolph’s annual “Teaching Math and Science in a Changing World” program, funded by a grant from the State Council of Higher Education Virginia (SCHEV) and the College’s Summer Research program. 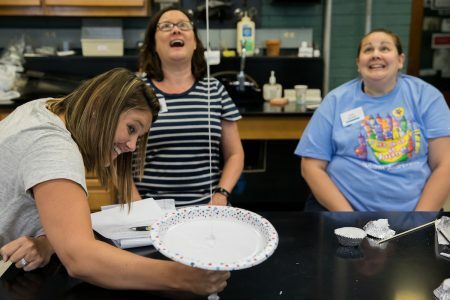 The weeklong institute is open to science and math teachers from Nelson, Campbell, Bedford, and Amherst counties as well as Lynchburg City and New Vistas Schools, and provides them with ideas for fun, hands-on activities for their students. Besides making biofilm prevention test kits, other activities included a crime scene investigation, innovative math teaching techniques, and an experiment on the viscosity (resistance of flow) of fluid in volcanoes. One of the other goals for the Randolph leaders of the program (Rumore, Peggy Schimmoeller, an education professor, and Peter Sheldon, the Charles A. Dana Professor of Physics and Engineering) is to hold roundtable discussions with teachers who have attended the institute multiple times. Josh Yeast ’19 and Damien Douglas ’21 are also assisting with the institute this year as part of Summer Research. The two students gathered supplies and set up activities for the institute, and are teaching some of the same lessons to children at the Jubilee Family Development Center next week. They also led a special children’s program at the Legacy Museum of African American History in Lynchburg earlier this summer. Yeast has served as a camp counselor each summer since ninth grade and wants to become a teacher himself. 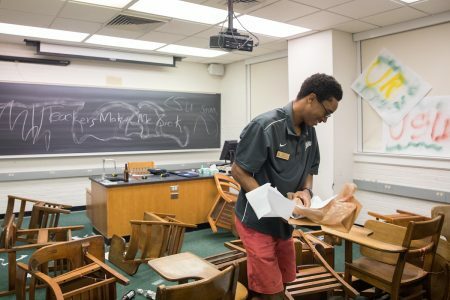 Josh Yeast ’19 prepares the “Crime Scene Investigation” activity, which involved a vandalized classroom. “I’m a liberal studies major, and when I read the proposal for the project and talked to my advisor about it, I knew it would help me not just get better at working with kids, but through the teaching institute I’m hoping to learn better teaching strategies too for when I enter the workforce,” Yeast said. A physics major, Douglas wants to keep all of his options open. “I’m considering going into the teaching program, so I thought this would be a good experience to see what I would be getting myself into if I make that decision,” he said.